Ezra Klein of the Washington Post went on MSNBC and showed us his true colors. In the military, we have a term for this kind of action - " self identification"
Identification is defined as " the act of claiming an identity, where an identity is a set of one or more signs signifying a distinct entity. " Now we have a case of what I call, "self identification", defined as "when someone (a friend, a colleague or a combatant on the battlefield) performs an action, either verbally or otherwise that shows their "true self ". " Hold on - Whiskey-Tango-FOXTROT?? What was that he said?? Are you kidding me - This is " the Mother of All Self-Identifiers". 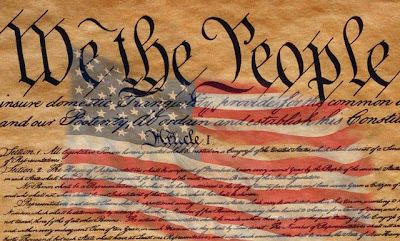 Ezra not only told us that he has no flippin' clue as to what the US Constitution means, he just walked all over it and wiped his feet on it ! WHAT A HORSE'S ARSE ! He has done us a favor in reality, (like most "self identifiers"), as he has shown us all his true colors....He is what we in the military would call a "domestic enemy" of the US Constitution as he says " that it has no binding power on anything.."
Oh yes it does, you twit. It means the difference between what the USA stands for along with all that millions of Veterans gave their lives to defend. Well, I am glad for one, to highlight him for the idiot he is and make sure that many others know that this is what we are fighting when true Patriots rail against the Lefty Looney Liberals who hate the US Constitution and all that it stands for....Freedom and all that has made us a beacon of Liberty since the US Constitution was ratified. Take that Ezra Klein...you have shown us your true colors and that you are a loser....and one who should be relegated to the dustbin of history, where we have deposited all others who have tried to take the US Constitution from the people. And just in case a few of you are feeling I have been a little harsh with Mr. Klein, let's read a posting he made on his own blog....again, I feel you will be able to draw your own conclusion.
" I'm with Jane Galt on this one: Not everything the Nazis touched was bad. Hitler was a vegetarian. Volkswagen is a perfectly good car company. Universal health care is a perfectly good idea. Indeed, the Nazis actually did a pretty good job increasing economic growth and improving standards of living (they were, many think, the first Keynesians, adopting the strategy even before Keynes had come up with it), pushing Germany out of a depression and back into expansion. Unfortunately, they also set out to conquer Europe and exterminate the Jews. People shouldn't do that. " Again, all is have to say is " Whiskey-Tango-Foxtrot???" US NAVY JEEP is a blog dedicated to presenting and promoting information that represents the USA & our fine Military, especially the US Navy & USMC. This also includes being candid and expressing opinions about issues and concerns that effect all of us in the areas of politics, defense and the domestic affairs of our country. This blog has no affiliation with the US Navy or United States Government. Along the way, I will also enclose info about Classic Cars, Warbirds and other topics of interest...I like to keep it interesting. I decided to feature the venerable US Navy Jeep because while the ground-pounders in the Army like to think it is exclusively theirs, the Jeep did a helluva lot of duty in the Navy and ferried Seabees/Marines across many miles and beaches fought for an inch at a time. I have also restored my own 1963 Willys Jeep and rededicated her as a Navy Jeep with correct paint scheme and lettering. She is a great old Jeep and I get lots of compliments on her. As a retired combat Veteran, I find that my ideals have not changed much since retiring and I find the words below to be some of the best ones to express how I feel about a life-long dedication to the US Navy's values of Honor, Courage & Committment.
" You go into Afghanistan, you got guys who slap women around for five years because they didn't wear a veil. You know, guys like that ain't got no manhood left anyway. So it's a hell of a lot of fun to shoot them. Actually it's quite fun to fight them, you know. It's a hell of a hoot. " General James N. Mattis - Commander of the US Central Command (USCENTCOM). Every newspaper now asks itself, with respect to every story: "Is it news?" All I suggest is that you add the question: "Is it in the interest of national security?" Col. Jessep: Son, we live in a world that has walls and those walls need to be guarded by men with guns. Who's gonna do it? You? You, Lieutenant Weinberg? I have a greater responsibility than you can possibly fathom. You weep for Santiago and curse the Marines; you have that luxury. You have the luxury of not knowing what I know: that Santiago's death, while tragic, probably saved lives and that my existence, while grotesque and incomprehensible to you, saves lives. You don't want the truth because deep down in places you don't talk about at parties you want me on that wall, you need me on that wall. We use words like honor, code, loyalty. We use them as the backbone of a life trying to defend something. You use them as a punchline. I'm a Human Resources professional with 25+ years of management experience with companies from the defense support services, healthcare, manufacturing, transportation, & human service sectors. I have a Bachelor’s Degree in Business Administration from Eastern Nazarene College. I'm a retired US Navy Combat Veteran and held the rank of Petty Officer 1st Class in the United States Naval Reserve. My awards include Meritorious Unit Commendations, Navy Unit Commendation Medal, 3 Naval Reserve Meritorious Service Medals, a National Defense Service Medal, 2 Navy & Marine Corps Overseas Service Medals, Iraq Campaign Medal and designation as an Expert Marksman with the 9 mm pistol & M-16 Rifle. I was a member of the crew on the USS CONSTITUTION in 1997 when she went under sail for the 1st time in 116 years. I have served on active duty with the US Navy in Iraq, Kuwait, Egypt, The UAE, Bahrain, Pearl Harbor Hawaii, Navy Base New Orleans LA, Newport RI, Port Hueneme CA, Cheatem Annex VA and Tampa FL. MERRY CHRISTMAS....Santa's got a Tank??? AIR RAID - PEARL HARBOR - THIS IS NO DRILL ! Did USMC Gen. James Mattis pull duty on Christmas so a Marine could be with his family? Female British Apache pilot in Afghanistan, " I've killed more people than ...Jack The Ripper and any other serial killer ...all put together"
How many people are viewing US Navy Jeep ?? ?